Happiness – as defined by Wikipedia - is a mental or emotional state of well being defined by positive or pleasant emotions ranging from contentment to intense joy. 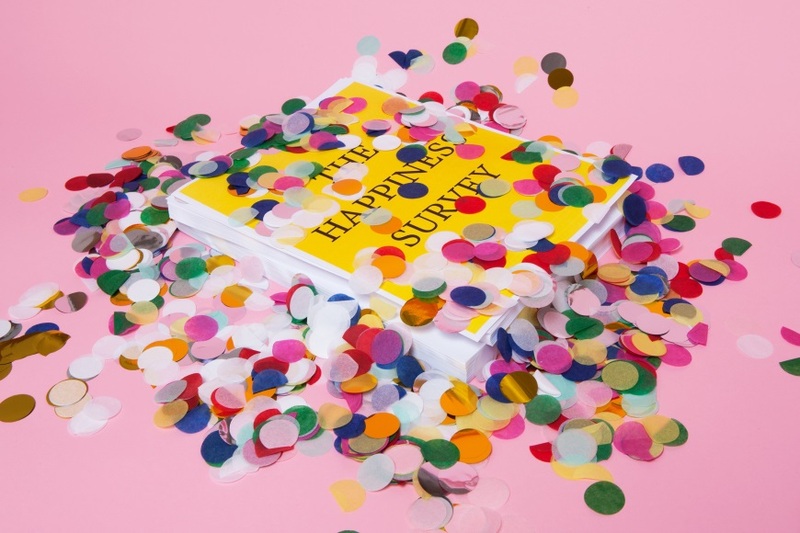 Various research groups, including positive psychology and happiness economics are employing the scientific method to research questions about what "happiness" is, and how it might be attained and measured. Let’s go back to Leonardo, despite being unaware of this complexity, he was able to paint Happiness in Mona Lisa smile so when we stare at Mona Lisa we perceive what well being (Happiness) is.The article explains “Kornmeier and a team used what is arguably the most famous art piece in the world in a study of factors that influence how humans judge visual cues such as facial expressions. Mona Lisa is often held up as a symbol of emotional enigma. The portrait appears to many to be smiling sweetly at first, only to adopt a mocking sneer or sad stare the longer you look. Using a black and white copy of the early 16th century masterpiece, a team manipulated the model’s mouth corners slightly up and down to create eight altered images — four marginally but progressively “happier” and four “sadder” Mona Lisa’s. A block of nine images was shown to 12 trial participants 30 times. In every showing, for which the pictures were randomly reshuffled, participants had to describe each of the nine images as happy or sad.The findings confirm that “we do not have an absolute fixed scale of happiness and sadness in our brain” and that a lot depends on context, the researcher explained. “Our brain manages to very, very quickly scan the field. 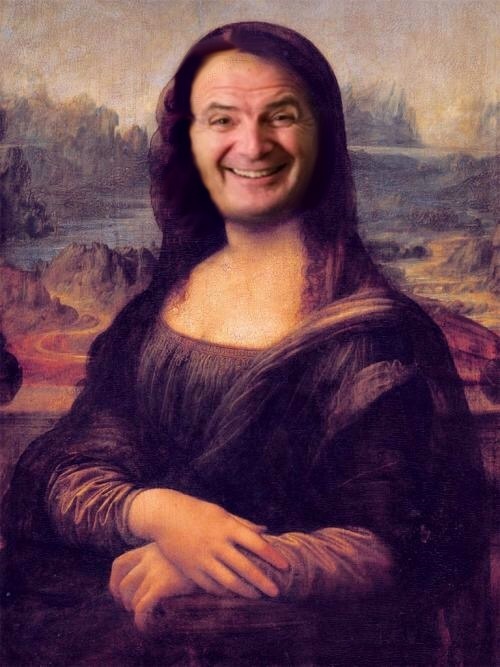 We notice the total range, and then we adapt our estimates” using our memory of previous sensory experiences, he said.Another interesting discovery was that people were quicker to identify happier Mona Lisas than sad ones. This suggested “there may be a slight preference …in human beings for happiness” said Kornmeier. While the brain can hardly recognize and quantify someone else’s happiness, socio economists try to measure it every year, gathering different data to be shared in the annual report that aims to measure the level of Happiness for almost 200 countries. They utilize 8 criteria -objectives and subjectives-: The first one, most commonly utilized in many economic measures is GDP per capita - adjusted in terms of Purchasing Power Parity (PPP) - measures the impact that income has on Happiness. Based on past analysis, Income variation contributes to 2% of total Happiness variation across countries. Above a certain threshold of Income per capita (above 35/40K$) happiness does not grow linearly. The time series of healthy life expectancy at birth measure the important element of physical health. A third element is Social support (or having someone to count on in times of trouble), then Freedom to make life choices is a powerful motivator of internal wellness, Generosity – “Have you donated money to a charity in the past month?” on GDP per capita. Finally Perceptions of corruption reduce Happiness status. Positive affect is defined as the average of previous-day affect measures for happiness, laughter and enjoyment and Negative affect is defined as the average of previous-day affect measures for worry, sadness and anger. In the 2017 Report, all of the top four countries rank highly on all the main factors found to support happiness: caring, freedom, generosity, honesty, health, income and good governance. Their averages are so close that small changes can re-order the rankings from year to year. Norway moves to the top of the ranking despite weaker oil prices hitting GDP. It is sometimes said that Norway achieves and maintains its high happiness not because of its oil wealth, but in spite of it. By choosing to produce its oil slowly, and investing the proceeds for the future rather than spending them in the present, Norway has insulated itself from the boom and bust cycle of many other resource-rich economies. To do this successfully requires high levels of mutual trust, shared purpose, generosity and good governance, all factors that help to keep Norway and other top countries where they are in the happiness rankings. 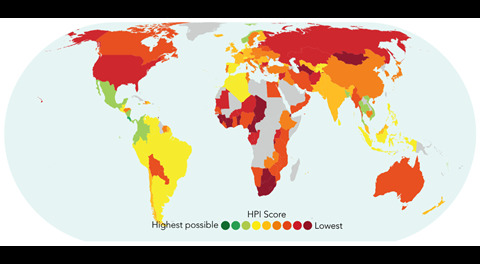 All of the other countries in the top ten also have high values in all six of the key variables used to explain happiness differences among countries and through time—income, healthy life expectancy, having someone to count on in times of trouble, generosity, freedom and trust, with the latter measured by the absence of corruption in business and government. A company, believes that the subjective method to measure Happiness is the most reliable and “reading people’s feelings via listening to their messages on Twitter is better then asking them if they feel Happy” as done in the Happiness Report. They propose a quicker methodology to measure in real time the level of Happiness in a certain area. It is based on iSA (integrated sentiment analysis), a novel algorithm designed for social networks and Web 2.0 sphere (Twitter, blogs, etc.) opinion analysis, i.e. developed for the digital environments characterized by abundance of noise compared to the amount of information. Instead of performing an individual classification and then aggregate the predicted values, iSA directly estimates the aggregated distribution of opinions. Through empirical analysis it was demonstrated that iSA outperforms machine-learning techniques of individual classification (e.g. SVM, Random Forests, etc.) as well as the only other alternative for aggregated sentiment analysis known as ReadMe. Voices routinely produces based on the algorithm daily statistics about the level of Happiness in Italian cities, showing trends, normal distribution. I checked its validity, too: when Pope Francisco visited Milan last week all indicators on Twitter were on HAPPY! As it is difficult to measure Happiness, the Economist in a recently published study, referring and leveraging the annual publication of the World Happiness report, tries to unpick what make people happy and sad. It is not easy according to it to measure happiness but we know what make people sad: Mental illness, Unemployment, Poverty, Being without a partner, Being uneducated or physical ill. Some of it can be measured and in the article various rankings and comparisons are made. Can Artificial Intelligence measure Happiness? In an interesting very recent podcast HR Happy Hour 279 - Artificial Intelligence for HR and for People (Listen HERE) Steve Boese and special guest co-host Madeline Laurano recorded a special Happy Hour Show live from Ultimate Connections 2017 in Las Vegas. They were joined by Ultimate Software's Cecile Alper-Leroux and Armen Berjikly to talk about the need to listen to the 'Voice of the Employee', the importance of technology to help HR leaders understand data, (especially unstructured data), and how modern technology solutions can help HR leaders move from just listening, to understanding, and finally, to taking actions, (and recommending actions). With a similar logic of Voices, they feel that getting data via AI is better then simply asking people how they feel. The theme for the Ultimate Connections Conference was 'Elevate' - and the key idea to how HR and business leaders can elevate the employee experience by listening to their needs more closely, applying new technologies that can help analyze data from employee surveys and other disparate sources for things like sentiment and tone, and finally using those insights to take actions that can improve the organization and the individual employee experience. Technology can help measure in real time Happiness levels. The European Union has approved a Directive on disclosure of non-financial and diversity information (2014/95/EU) entered into force in December 2014. This ambitious legislation requires around 6,000 large companies listed on EU markets, or operating in the banking and insurance sectors, to disclose relevant environmental and social information in the management report, with the first reports to be published in 2018 (on financial year 2017). The Directive requires the Commission to prepare non-binding guidelines to be published as soon as possible in the spring 2017. Large public-interest entities (listed companies, banks, insurance undertakings and other companies that are so designated by Member States) with more than 500 employees should disclose in their management report relevant and useful information on their policies, main risks and outcomes relating to at least environmental matters, social and employee aspects, respect for human rights, anticorruption and bribery issues, and diversity in their board of directors. How Finance can contribute to measure? Companies are a team or group of individuals with a common goal. The level of Happiness of that team is influenced by how “hard measurable objectives” are achieved and how is the culture/spirit of the team. The Objective and Subjective elements contribute to the level of Happiness, even though it is not defined in this way. Normally companies refer to a so-called “level of engagement” that is a proxy of Happiness. 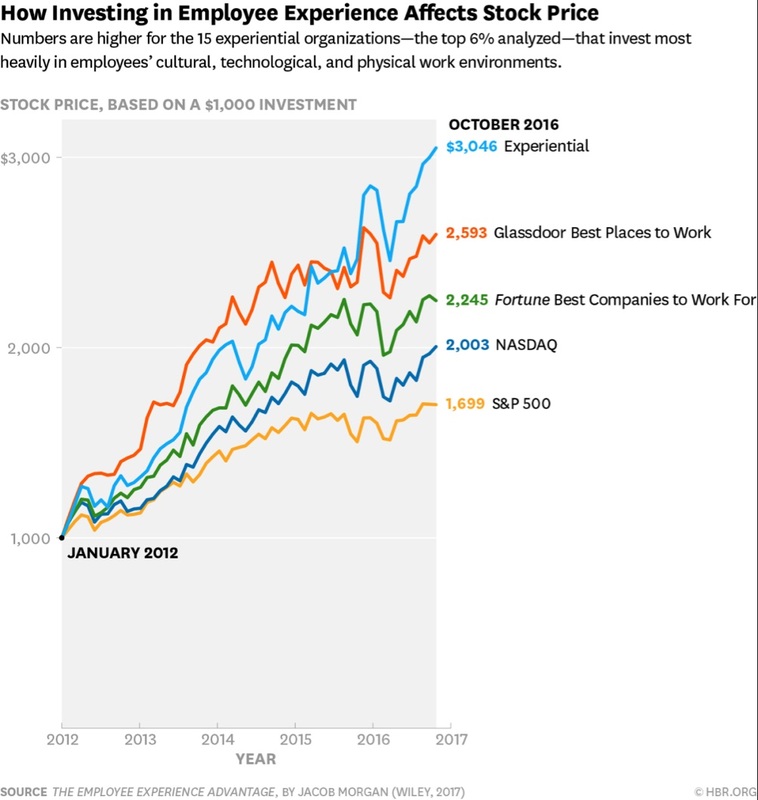 So Companies are not far from being able to measure how much people are Happy to work there and being part of a wider Society, a Company could also try to measure how it contribute to the overall Happiness. The EU Directive it is an important incentive to do so. In the next article I will share how companies are preparing to measure their impact and how much they are willing to embark in measuring Happiness. Non chiedetemi come hanno fatto, certo è che ci sono riusciti. L’idea dei ricercatori di Boston era assolutamente lungimirante e l’obiettivo davvero ambizioso: capire cos’è che ci consente di vivere bene e a lungo. Così gli studiosi dell’Università di Harvard hanno preso nota di tutto quello che succedeva ai quasi 300 studenti ammessi al College tra il 1938 e il 1944: stato di salute — fisica e mentale — lavoro, famiglia, amici e tanto d’altro (lo studio va avanti da 80 anni e non si fermerà, pare, tanto presto). E cosa hanno scoperto? Quello che avevano già capito i Beatles: «Love, love, love», insomma, è l’amore a farti vivere bene. Non solo ma l’educazione è più importante dei soldi e dello stato sociale, mentre la solitudine uccide, proprio come l’alcol e il fumo. «Non basta essere brillanti per invecchiare bene — ha scritto George Vaillant, uno di coloro che si sono avvicendati a capo di questa avventura — devi essere innamorato, o comunque avere relazioni affettive forti, in famiglia (padre e madre naturalmente, ma anche fratelli, sorelle, zii, cugini e tutti quelli che ci vengono in mente) e fuori, e poi tanti amici». «Ma non dovevano essere i livelli di colesterolo e la pressione alta a far male?» direte voi. Sì certo, ma l’uno e l’altra a detta degli studiosi di Harvard contano meno della famiglia o dell’avere un legame affettivo stabile per esempio. Insomma è come se a tutti i consigli, comunque preziosissimi, di tanti bravi medici per invecchiare bene «non fumate, bevete poco alcol, e poi frutta, verdura e pesce, e attività fisica» ne mancasse uno che è forse il più importante: «Dedicate tempo ed energie ai vostri rapporti con gli altri». Sul lavoro? Certo, ma anche fuori se volete, non importa. Imparare a farlo avvantaggia specialmente il cervello e gli scienziati l’hanno documentato con test di performance intellettuale e con tanti altri esami incluso l’elettroencefalogramma (che hanno ripetuto periodicamente per 80 anni!). Anche i rapporti sociali dei più piccoli sono importanti — con gli altri bambini o con gli adulti non importa, l’importante è che ne abbiano — più fanno esperienze diverse e più giocano, meglio è. Nessuno studio è perfetto e non lo è nemmeno lo studio «Grant» non fosse altro perché quanto abbiamo scritto finora potrebbe valere solo per i maschi in quanto al College a quei tempi ci andavano solo gli uomini — tutti fra l’altro bianchi — gente altolocata di solito (uno dei primi a prendere parte allo studio fu un certo John Fitzgerald Kennedy, sì, proprio lui, il futuro Presidente degli Stati Uniti e poi Ben Bradlee per moltissimi anni direttore del Washington Post). E gli altri? Ci sono stati grandi imprenditori, avvocati di grido e medici famosi, ma c’era anche gente normale e persino certi che poi ebbero una vita miserevole: alcolizzati per esempio o drogati o schizofrenici. Col passare degli anni lo studio si è arricchito di molte altre persone, anche donne e di un’attività parallela «Glueck» cui hanno preso parte soprattutto ragazzi, questi però vivevano nei sobborghi di Boston e, come potete immaginare, il confronto fra loro e quelli del College ha fornito indicazioni preziose. Vi chiederete dove gli studiosi abbiano trovato i fondi per fare tutto questo e per poter andare avanti per così tanti anni. Dal governo federale in parte e poi dai National Institutes of Health e dalle tasse dei cittadini; anche se adesso c’è chi comincia a criticare questa scelta a cominciare dal presidente Trump: «Cosa continuiamo a spendere soldi per questo studio quando dovremmo invece preoccuparci di trovare nuove terapie per il cancro o per l’Alzheimer?». Se lo chiedete a Robert Waldinger, che ha seguito «Grant» per più di 30 anni, vi dirà che proprio grazie ai dati che sono stati raccolti in tutto questo tempo è stato possibile stabilire che chi è omosessuale non ha scelto di esserlo per esempio o che l’alcolismo non è una colpa ma una malattia e tante altre cose ancora. Non solo ma se oggi siamo capaci di interpretare almeno un po’ certe scelte di vita della gente dipende proprio dal fatto che qualcuno si è preso la briga di seguire queste persone dalla giovinezza alla vecchiaia. Il bello è che Waldinger non ha alcuna intenzione di fermarsi, adesso sta studiando i figli degli studenti del College del ’38 e persino i figli dei figli: «È entusiasmante — dice — presto avremo tantissime informazioni e sapremo rispondere a domande a cui nessuno ha mai saputo rispondere fino ad ora». E chissà che un giorno questi dati non possano persino portare un contributo allo sforzo che si sta facendo un po’ dappertutto per prevenire certe malattie — cardiovascolari e diabete per esempio — ma anche i disturbi del sistema nervoso, o per rallentare l’invecchiamento. Se fosse così avremmo un mondo migliore e i sistemi sanitari di tutto il mondo risparmierebbero tantissimi soldi. Most of us under the age of 50 or so, to according a new analysis of life satisfaction encompassing seven massive surveys and 1.3 million randomly sampled people from 51 countries are unhappy. 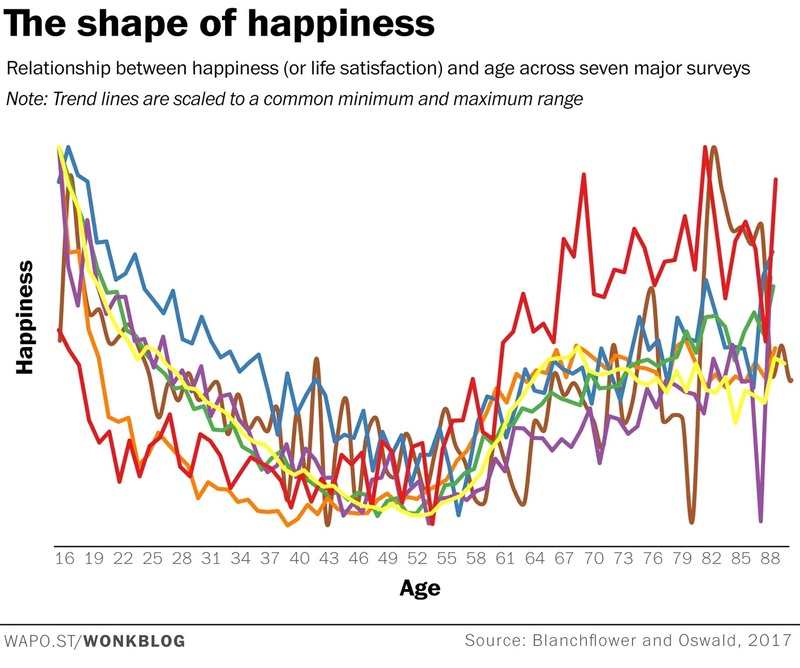 Happiness, those surveys show, follow a generalized U-shape over the course of a life: People report high degrees of happiness in their late teens and early 20s. But as the years roll by, people become more and more miserable, hitting a nadir in life satisfaction sometime around the early 50s. Happiness rebounds from there into old age and retirement. The shape of the curves, rather than any absolute value, are what's important here. 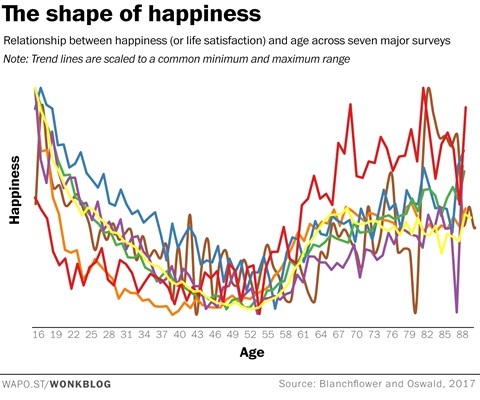 The surveys asked about happiness in different ways — some framed it in terms of “satisfaction,” while others asked people to rate where they fell between “happy” and “unhappy.” So the absolute values of each line aren't directly comparable. Two things stand out: First, the curves all follow the same general U-shaped trajectory. Youth and old age are periods of relative happiness, while middle age is something of a rock bottom. Second, they generally agree that the bottom of that U hits some time in the early 50s. Researchers have been finding evidence of a U-shaped happiness curve for years now. It's even been observed among apes. The strength of this particular study is in demonstrating how consistent that curve is across a variety of different data sources. Note that rock bottom in the chart above doesn't denote absolute misery — people in their 50s still generally rate their life satisfaction in the mid-to-high range, a seven out of 10, for instance, or a 3.5 out of five. But that's substantially and significantly lower than how people in their late teens or early 20s rate their happiness. The difference between the two — happiness at youth and happiness at middle age — is roughly equivalent to the decline in well-being caused by getting divorced or losing a job, according to the analysis. “There is much evidence,” the paper's authors conclude, “that humans experience a midlife psychological 'low.'" The exact causes of this aren't entirely clear. One common explanation is that in wealthy countries like ours, middle age is a particularly stressful time. People in their late 40s and early 50s are often at the peak of their careers (will all the headaches that entails), and many are dealing with unruly adolescent children to boot. There's also some disagreement about the universality of the U-shaped happiness curve. Researchers who have teased out country-level trends have found different variations on the curve, particularly among less wealthy nations. Other researchers have examined longitudinal data, which tracks the same individuals over time, and found evidence for flat or wavy happiness trajectories throughout a lifetime. For almost a decade Buthan has used Happiness measure to evaluate their political decisions, now the apply . Mettiamola così: la misurazione delle felicità è uno dei passatempi più strategici per un politico. Il consenso passa da quelle parti. Per quantificare il benessere di una popolazione si usano tradizionalmente indicatori economici di flusso (e non) come il Pil, i consumi o gli indici di fiducia. I social consentono una misurazione in tempo reale più puntuale, più emotiva e senza una grammatica alla base ancora in grado di comprenderne i limiti. Per rispondere quindi alla domanda: le persone sono felici?m, occorre quindi in primo luogo arrendersi all’evidenza che i social riguardano “solo” oltre 2 miliardi di persone che hanno smartphone o un pc, vivono in paesi con una connessione a internet e non vivono in condizioni di estrema povertà. Il che restringe in assoluto il senso della domanda sulla felicità. Can you meausure your Happiness level with a Smartphone? Happiness – as defined by Wikipedia - is a mental or emotional state of well-being defined by positive or pleasant emotions ranging from contentment to intense joy. Happy mental states may also reflect judgements by a person about their overall well-being. A variety of biological, psychological, economic, religious and philosophical approaches have striven to define happiness and identify its sources. Various research groups, including positive psychology and happiness economics are employing the scientific method to research questions about what "happiness" is, and how it might be attained. The United Nations declared 20 March the International Day of Happiness to recognise the relevance of happiness and well-being as universal goals. In the fifth World Report expected to be published on March 20 2017, Happiness will be measured in the Report along 8 parameters (detail at the end of the article) and countries are ranked accordingly. Higher GDP per Capita Higher Happiness – Money increases Happiness? Spend on others. In a study published this year, Harvard University researchers conducted experiments and found out that spending money on others (called “prosocial” spending in academic jargon) boosts people’s emotional and physical well-being.“The benefits of prosocial spending… extend not only to subjective well-being but objective health,” they write. Despite people’s intuitions and inclinations to the contrary, one of the best ways to get the biggest payoff personally from a windfall of $20 is to spend it prosocially." Buy small splurges. Dropping a ton of cash on something extravagant doesn’t give you the same bang for your buck because, no matter how special it is at first, you get used to having it over time and it becomes just another object. “Giving yourself inexpensive indulgences is a clever way to gather up lots of bursts of happiness,” a recent Business Insider article suggests, citing Gilbert’s research. Buy what you like. No keeping up with the Joneses — that’s not going to make you happy. “There are a lot of reasons someone might buy something… but if the reason is to maximize happiness, the best thing for that person to do is purchase a life experience that is in line with their personality,” Ryan Howell, an associate psychology professor San Francisco State University, tells Forbes. Howell recently co-authored a study finding that when people spend money just to project or uphold a certain image, it doesn't bring happiness. Spend with others. You might think spending money on things or activities you do by yourself will make you happy, but a recent study in Psychological Science says that tactic can backfire. “To be extraordinary is to be different than other people, and social interaction is grounded in similarities,” says Gus Cooney , Harvard University research assistant and lead author of the study. Doing things with friends or family, even if it’s not as exciting, makes you happy because it fosters a sense of togetherness and connection between you and other people. “The guy who had the extraordinary experience had a harder time fitting in,” Cooney tells The Atlantic. Companies contribute to increase GDP – Generate wealth and Money - Are they producing Happiness? In simple terms, GDP per Capita - Gross domestic product (GDP) used in the measure of Happiness, is the monetary value of all the finished goods and services produced within a country's borders in a specific time period it is then divided by the inhabitants and adjusted by PPP. In other words, it is the sum of the Revenues of all companies and individuals working in a certain country. So the more the company sell the higher should be Happiness. “No, Marco, there is no happiness at work, - Richard, a young production manager says - “I take care about my personal happiness following the advices of Action For Happiness: I do things for others, I connect with people, I take care of my body and mind health, I keep learning new things, I am resilient and know my direction. I accept myself, feel part of something bigger and look for what is good. With my dears, my family I feel happy. But the in the company we have always to change the goalpost of what success looks like: we launch a product successfully that becomes the base for the next one to be even better; profitability is improved, then we have to apply “continuous improvement’ methodologies; you have done a good job, now you have to do a better one; you hit your sales target, we're going to change it. And if happiness is on the opposite side of success, your brain never gets there. We've pushed happiness over the cognitive horizon, as a society. And that's because we think we have to be successful, then we'll be happier” Company puts too much pressure on success. Laura, from Marketing, sees it differently: “A company is an ideal place where to grow and nurture happiness: when a group of people is together to pursue a common goal, if they share emotions and align their individual way of finding their personal purpose in life and how it fits to the company purpose of the company one works for. You may know that we launched a program almost 2 years ago where we helped people to find/or define clearer their personal purpose. The feedback I got about the program and how I saw the people coming out of the program was exciting. I also think it has a lot to do with how one can grow every day and how much you are supported in that. Balance is also important. The more you are balanced with a work you like and your private life, it helps to be happy. I personally think appreciation for what you do is very important. And it does not need a lot. And we should not forget…the more employees are happy…the more they are engaged….and the more we succeed with our customers!!! - Setting the right expectations (that does not prevent from being ambitious and aim for excellence and success). - Appreciate the flow of personal relations and challenges happening every day: the 1:1 and team meetings, the several exchanges of opinions, the decision-making moments, the lunches (we should never skip lunch or have lunch alone), the coffee breaks (you know how I loved my former company's cafeteria...): in a nutshell, appreciate the beauty of connections and always be "in the moment". - Stay balanced, aware of who we are and always keep our personal and professional values as a compass, particularly when the going gets tough and the pressure (for deadlines, performance, financial results, etc.) mounts high. I also believe that being happy is the secret for being successful in the true sense, best represented by the words of poet Maya Angelou: “success is liking who you are, liking what you do and liking how you do it”. “It would be great to apply the logic of the World Report and define a set of measures for Happiness ranking or rating within a company - Annette from HR Business partner team says - I saw in a recent article by Jacob Morgan author of “The Employee Experience Advantage” on HBR that “investing in Happiness” gives high returns: it had led not only to happier employees but also to larger talent pipelines and greater profitability and productivity. Morgan in addition found that, for instance, compared with the other companies he studied, those that invested most heavily in employee experience were included 28 times as often among Fast Company’s Most Innovative Companies, 11.5 times as often in Glassdoor’s Best Places to Work, 2.1 times as often in Forbes’s list of the World’s Most Innovative Companies, 4.4 times as often in LinkedIn’s list of North America’s Most In-Demand Employers, and twice as often in the American Customer Satisfaction Index”. Measuring Happiness not only at Country and Society as the World report does but at a Company level could contribute to monitor more frequently this key variable for individual and companies well being. You will find more in one of the next The Happy CFO articles. 1. GDP per capita is in terms of Purchasing Power Parity (PPP) measures the impact that income has on Happiness. 2. The time series of healthy life expectancy at birth measure the important element of physical health while the aspect of mental health should then be measured in addition, suggests Lord Layard. 3. Social support (or having someone to count on in times of trouble) Today only 30% of people in UK and US think that most of the people can be trusted. 5. Generosity – “Have you donated money to a charity in the past month?” on GDP per capita. The link between higher national income and higher national life satisfaction is critical to economic policymaking. This column presents new evidence that the connection is hump-shaped. There is a clear, positive relation in the poorer nations and regions, but it flattens out at around $30,000–$35,000, and then turns negative. Across cultures and time, happiness was most frequently defined as good luck and favorable external conditions. However, in American English, this definition was replaced by definitions focused on favorable internal feeling states. In contrast, in cultures where happiness is conceived as luck and fortune, happiness might not be the conscious goal. Thus, various decisions might not be made to maximize happiness. Additionally, activities and occasions that are considered “happy” can vary from culture to culture. The Washington Post gives an example of an old woman in China picking out her burial clothes. She calls it “a happy thing.” Meanwhile, only the most morbid of Westerners would agree with this sentiment. Understand the local culture, and how it differs from your own. Understand the emotions you’re selling, and what provokes them in your target audience. Sometimes, translation isn’t enough. Transcreation is often a better option. With transcreation, marketing campaigns are reinvented to take cultural differences into account and produce a consistent emotional response.